Description : Taking this 4 days medium trekking trip you will enjoy hiking from 6 to 7 hours every day, follow foot paths up and down mountains, through forest, terraced rice paddies, crossing river and water streams by suspension bridges… from village to village of different ethnic minorities including H’mong, Zao, Zay, Tay… paying visit to local homes, witnessing daily life activities and especially village home staying will bring the interesting insight of local life. 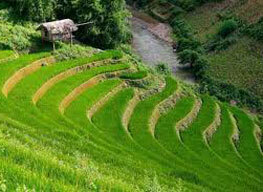 The last day is set for your own plan in Sapa to enjoy your self relaxing and wandering the charms of this old French hill station. 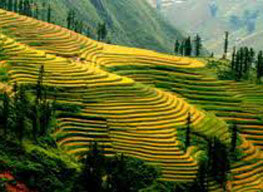 Picked up at Lao Cai Station upon your early arrival for over an hour drive uphill in a shared mini van to Sapa. After freshen up and Breakfast in a local restaurant, transfer 6km along the main road to a beautiful spot where your village trek begins. This part offers spectacular scenery of the highest part of Hoang Lien Son mountain range and in a nice day, Fansipan Peak can be seen. 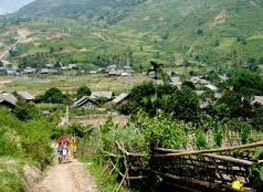 Crossing the river by a suspension bridge you will challenge your feet uphill to Y Linh Ho village. 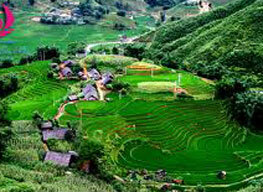 Here you will pay visiting to some H’mong families, watching them doing their daily works. After picnic Lunch, the trail continues up and down hill for about 2 hours as you reach to Lao Chai, a large village of the H’mong and then following the river bank to Ta Van of the Zay people, paying visiting to local homes, village schools… you will enjoy much your cultural discovery of local ethnic peoples as well as breathtaking scenery of the Muong Hoa Valley. 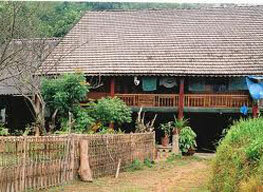 Tonight you will enjoy a home stay in Ta Van Village for an unique life experience. 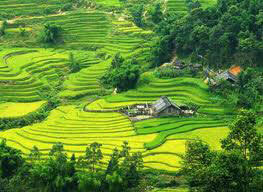 Leaving Ta Van village after Breakfast and following the foot path uphill, you will pass through impressive terraced rice paddies on the hill slopes before getting through a bamboo forest, a huge waterfall to Giang Ta Chai village of the Red Zao peoples. Walking around the village you will meet many women with their embroidery work to make their traditional dresses, occasionally you can see the blacksmiths making farming tools and even hunting riffles. Passing the Muong Hoa river again and then trek uphill to Su Pan village passing the rocks field with unique carving which is believed to be the messages of the ancient peoples. In this village you will see the special technique to build houses on the steep rocky land. 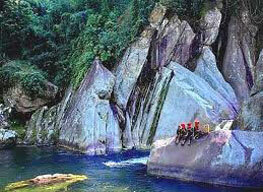 From Su Pan trekking downhill for an hour, Ban Ho valley will opens wide in your sight. Arriving to Ban Ho of the Tay late in the afternoon, check in the spacious local house built on stilts for Dinner and Home stay. After Breakfast we spend an hours walking to explore Ban Ho, a large village of the Tay peoples who live on spacious wooden houses built on stilts and very well organized before ascending uphill to Nam Toong village of the Red Zao. The trail of this part is really steep but the higher you reach to, the more stunning scenery will open in your sight. The village locates on the top of a hill and almost isolated and the houses are rudimentary but the peoples are very welcoming. After visiting Nam Toong, you will take another trail back to Ban Ho village an then pick up for transferring back to Sapa by Jeep. Picked up in the afternoon at about 16.00 by mini bus for a transfer downhill to Lao Cai station for taking the night train back to Hanoi which arrive early next morning and your trip ends. 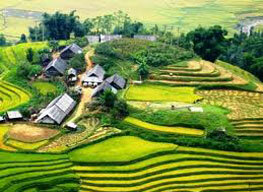 • Accommodation: 1 night in deluxe hotel in Sapa and 1 night at village.